Idly reading Colin Wilson's "The Strength to Dream' this morning I came across his piece on Sheridan Le Fanu. Talking of dreams, I have long dreamed of finding one of his 3 deckers, the nearest I have got to this recently was finding in an island bookshop, practically mint, a first of his posthumous 'Evil Guest' which, when I got it home, sold like a bullet for a monkey (£500). Some of his 3 deckers can go for the price of a new (and loaded) Lexus. Colin writes that Le Fanu is the only great writer of the supernatural that the UK has ever produced and that his 'Green Tea' is the most convincing ghost story ever written. 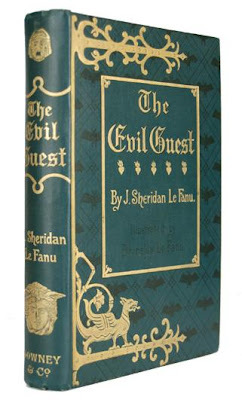 The curious thing is that Le Fanu actually collected ghost stories himself. I fantasise that somehow the collection stayed together and is to be found in a huge trunk, unclaimed in a Dublin furniture repository. One day, a mere 136 years after its owners demise, they open it, check on Google and email me that it needs shifting a-sap 'for a fair and reasonable price.' Madness. '... so entirely that Dublin, always ready with a nickname, dubbed him ‘The Invisible Prince;’ and indeed he was for long almost invisible, except to his family and most familiar friends, unless at odd hours of the evening, when he might occasionally be seen stealing, like the ghost of his former self, between his newspaper office and his home in Merrion Square; sometimes, too, he was to be encountered in an old out-of-the-way bookshop poring over some rare black letter Astrology or Demonology.